Tag Archive | "preet bharara"
There’s a simple reason for that: Preet Bharara is not busting Wall Street. He’s not collaring the masters of the meltdown. He’s done nothing to even slightly discomfit Wall Street’s still-ferocious money machine, or has yet to bring to justice the architects, enablers and continuers of the 2008 financial crisis — the bankers who got us into that mess, and the ones who are continuing to extract pain from foreclosed homeowners, in the New York area and beyond. 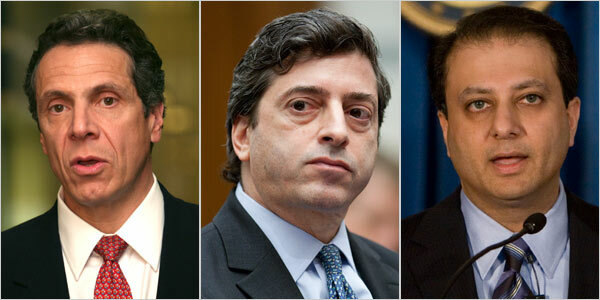 ProPublica, Nov. 1, 2011, 5:51 p.m.
Federal prosecutors sued Allied Home Mortgage Capital Corp. and two top executives Tuesday, accusing them of running a massive fraud scheme that cost the government at least $834 million in insurance claims on defaulted home loans. Houston-based Allied and its founder and chief executive, Jim Hodge, were the subject of July 2010 stories by ProPublica , which detailed a trail of alleged misconduct, lawsuits and government sanctions spanning at least 18 states  and seven years. Borrowers recounted how they had been lied to by Allied employees, who in some cases had siphoned the loan proceeds for personal gain. Some borrowers lost their homes. Despite years of warnings, the federal government had not 2014 until this week 2014 impaired the company’s ability to issue new mortgages. The suit , filed Tuesday in U.S. District Court in Manhattan, seeks triple damages and civil penalties, which could total $2.5 billion. Simultaneously, the U.S. Department of Housing and Urban Development suspended the company and Hodge from issuing loans  backed by the Federal Housing Administration. The company was also barred from issuing mortgage-backed securities through the Government National Mortgage Association (Ginnie Mae). Allied has billed itself as the nation’s largest, privately held mortgage broker, with some 200 branches. (At one point, the company operated more than 600.) The sprawling network made Hodge a rich man  with properties in three states and St. Croix in the U.S. Virgin Islands and two airplanes to get to them. The government’s complaint alleges that between 2001 and 2010, Allied originated 112,324 home mortgages backed by the FHA, which typically go to moderate- and low-income borrowers. Of those, nearly 32 percent 2014 35,801 2014 defaulted, resulting in more than $834 million in insurance claims paid by HUD. In 2006 and 2007, the company’s default rate was a “staggering” 55 percent, the complaint said. In addition, another 2,509 mortgages are currently in default, which could result in another $363 million in insurance claims paid by HUD. Borrowers told ProPublica last year that company employees falsified records to bolster their credit worthiness and lured them into unaffordable deals by lying about the terms. Allied had the highest serious delinquency rate  among the top 20 FHA loan originators from June 2008 through May 2010. Nine states had sanctioned the firm from 2009 to mid-2010 for such violations as using unlicensed brokers and misleading a borrower. Federal agencies had cited or settled with Allied or an affiliate at least six times since 2003 for overcharging clients, underpaying workers or other offenses. At least five lenders had sued, claiming Allied tricked them into funding loans for unqualified buyers by falsifying documents and submitting grossly inflated appraisals, among other allegations. Allied spokesman Joe James said the company was aware of the government lawsuit but had not received a copy of it and could not comment. In an interview Tuesday, Helen Kanovsky, HUD’s general counsel, defended the time it took her department to take action. “We had tried sanctions before,” she said. “We had assessed civil monetary penalties, and that had not worked. The government’s 41-page lawsuit details an alleged scheme by Allied to deceive HUD about its employees and the risks associated with its loans. For years, it operated a network of “shadow” branches that were not approved by HUD and falsely certified that they met legal requirements. Allied also disguised the high default rates of some branches, the complaint alleges, by tinkering with their addresses to apply for new HUD identification codes for the same offices. When HUD updated its system to prevent such manipulation, Allied simply moved all of its branches to a sister company and obtained new IDs, “thus again achieving a clean slate on its default rates,” the suit said. The sister firm, Allied Home Mortgage Corp., is also named as a defendant. In one case, Hodge instructed his chief information officer to capture the password for the personal email account of Jeanne Stell, the company’s executive vice president and compliance officer. Then he installed an electronic listening device under the information officer’s desk, the complaint alleges. Allied also was employing felons, including a state manager who had been sentenced to 60 months in prison for distributing methamphetamine, as well as a branch manager running the office under a false name, the suit said. The government joined a whistleblower lawsuit filed by a former Allied branch manager in Massachusetts, Peter Belli. In addition to Allied and Hodge, the suit also names Stell as a defendant. Allied is also facing at least one federal criminal investigation into its now-shuttered Hammond, La., branch. In multiple lawsuits, borrowers allege that the office deceived them from 2005 through 2007 by misrepresenting loan terms, falsifying records, failing to pay off prior mortgages and diverting hundreds of thousands of dollars.